A reminder to everyone that there are only two days left to pre-order your autographed copy of This Dance of Bliss. I can take pre-orders up to and including Saturday, September 1st. If you are mailing your order, please try to post it by this Saturday. I will, of course, allow plenty of time for mailed orders to arrive. If you aren’t able to purchase a pre-order copy, the new anthology will be available through Amazon and Barnes & Noble beginning in late September. This new Poetry Chaikhana anthology has been in the works for a few years now. I am so pleased to be able to share it with all of you. 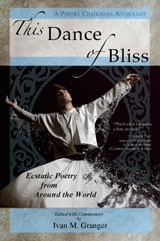 I hope its poems and musings inspire your own dance of bliss!